Last week 11 brave Republican lawmakers stood up for what’s right and filed an impeachment resolution against Deputy Attorney General Rod Rosenstein. As reported by The National Sentinel, the lawmakers – led by House Freedom Caucus Chairman Mark Meadows of North Carolina and Rep. Jim Jordan of Ohio – accused Rosenstein of intentionally withholding documents and information from Congress; failing to comply with congressional subpoenas; and abusing the Foreign Intelligence Surveillance Act court. In addition, Rosenstein signed the third of three FISA applications used to spy on Trump campaign adviser Carter Page, even though Republicans note he was aware that the warrant applications relied heavily on the phony-baloney “Russia dossier” paid for by the Hillary Clinton campaign and the Democratic National Committee. “If that wasn’t bad enough, it was Rosenstein who then appointed special counsel Robert Mueller to investigate the wholly fabricated narrative of Russian collusion and obstruction of justice — further hampering POTUS Trump in his ability to run the country and conduct foreign policy,” The National Sentinel reported. And yet, despite all of these allegations – which are based on documented evidence – Rosenstein’s supposed boss, Attorney General Jeff Sessions, publicly voiced support for his deputy the day the impeachment resolution was filed. “My deputy, Rod Rosenstein, is highly capable. I have the highest confidence in him,” Sessions – a former long-serving U.S. senator – said, as reported by Reuters. “What I would like Congress to do is to focus on some of the legal challenges that are out there,” especially when it comes to dealing with illegal immigration. Does the Deep State have something on Sessions? 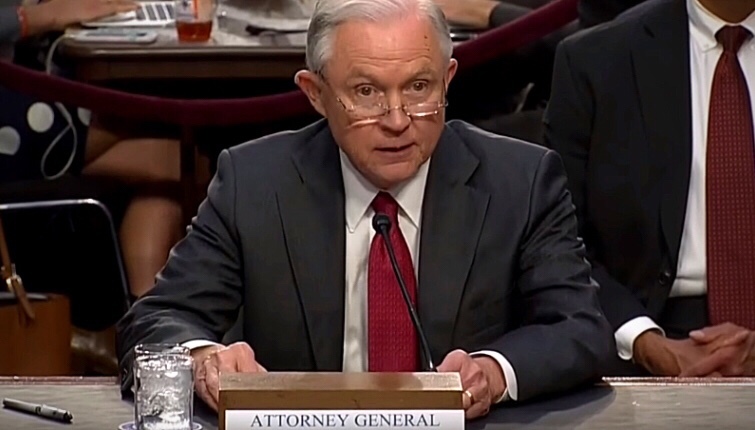 But it’s equally difficult to hear Sessions say such things with a straight face, especially since not all that long ago as a serving lawmaker he was very likely frustrated by the Obama administration’s repeated refusals to turn over information to congressional committees in a timely manner. And does he remember that Obama’s first AG, Eric Holder, was held in contempt of Congress for refusing to cooperate on the “Fast and Furious” scandal; does he want to be remembered as running the same kind of Justice Department? Rosenstein hasn’t just been withholding documents and thwarting Congress’ constitutional oversight role. Many of the documents he has ‘allowed’ to be transferred to various committees are so redacted as to nearly be useless. He claims the redactions are heavy because of “ongoing investigations” but a) these lawmakers are cleared to see sensitive information; b) they’re entitled to see it; and c) many long-time Washington watchers know that heavy redactions most often are done to protect certain people or agencies from embarrassment or criminal exposure. So are we. And we’re tired of Jeff Sessions allowing it to happen. He needs to go. Read more about conservative efforts to clean up Obama corruption at Conservative.news. Next Censorship PURGE points to imminent false flag violence before mid-term elections… bigger than 9/11?